Cathy Jack Coupland presents the next Friday showcase at the Guild office at 10am on Friday, 6 November 2009. All welcome! ($5.50 entry fee). 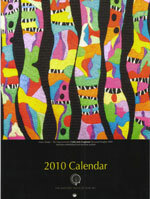 Cathy's stunning work is featured on the cover of the 2010 Guild Calendar. 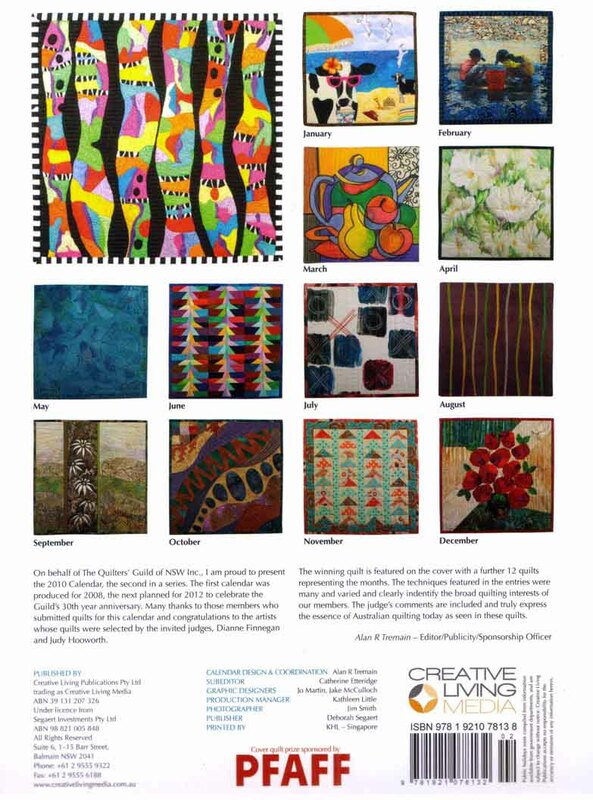 Congratulations to Guild members (including Anna Brown, Cathy Jack Coupland, Sue Dennis, Pamela Fitzsimons, Jan Frazer, Helen Gray, Alvena Hall, Alison Muir and Carolyn Sullivan) whose work has been selected for Art Quilt Australia 09, an exhibition of contemporary quilts presented by Ozquilt Network Inc and Craft ACT. The exhibition opens on Saturday 7 November and continues until 19 December 2009 at the Craft ACT Craft & Design Centre, Level 1 North Building, 180 London Circuit, Canberra City ACT. Fabric Samples Thistle design for Drawingroom sofas. The Quilt Study Group of NSW visited Old Government House Parramatta on 10th October 2009. Fourteen members of the Quilters' Guild of NSW Inc. visited Old Government House for the last event of the year organised by the Quilt Study Group of NSW. The building, which is home to one of the finest collections of early colonial furniture in Australia, has curtains, braids, bed hangings, mats and othersoft furnishings that were made by hand for the rooms on the ground floor of the house. Because of the expense of sourcing the soft furnishings from commercial sources, the National Trust of NSW decided to call for volunteers to make them instead. Thus was the five year long Soft Furnishings Project created. There are 20 or so volunteers who form the main team of the Project. They worked under the guidance of Dr James Broadbent, who sourced the fabrics, and Elizabeth Wright who worked on the designs. Some had existing skills but many developed new skills for the tasks at hand. These included painting on velvet, spinning cords for bell pulls, and the painstaking work of binding silk thread over vellum strips to form tassels. Rug making and upholstery skills were also required. The tassels and fringes, which would have cost thousands of dollars if purchased from European workshops, were all made by hand by the volunteers. After a very informative guided tour of the house four of the Soft Furnishings Project volunteers kindly took us back to the rooms where their work was exhibited and explained exactly how they had created the items. Back in the Soft Furnishings Project work room we were allowed to touch the items, and the ladies demonstrated how they had created these amazing braids, curtains, mats etc. Thelma, Sue, Nerida and Fran were all veryhelpful and informative in sharing their knowledge and experience with us. If you want to see the house and visit the Soft Furnishings Project room to look at their exhibits and source references, the volunteers for the Soft Furnishing Project are at Old Government House on Wednesdays between 10 - 2 pm. Phone 02 96358149 to confirm the project volunteers will be there before visiting. As announced at the recent annual general meeting, for the Sydney Quilt Show 2010, there will be an exciting new special award - 'Best Reproduction Inspired by an Antique Quilt' with a prize of $500 jointly sponsored by Dr Annette Gero of Historic Australian Quilts & Melinda Smith of Quiltsmith. Entries that are reproductions that are inspired by Australian, American or English antique quilts are eligible for this award. If you would like your quilt to be considered for this award, please tick the relevant box on the entry form and supply supporting particulars identifying the inspiration antique quilt. You will also be required to supply an image of the antique quilt which inspired your entry quilt and from where it has been sourced. 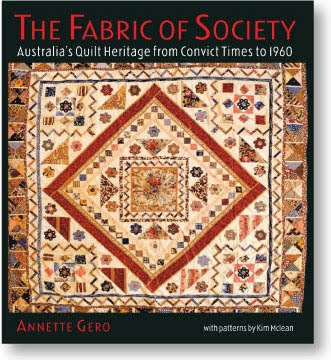 You will find plenty of inspiration, together with patterns of 29 of the heritage quilts, in Dr Gero's book The Fabric of Society available from www.annettegero.com. 2010 is not far away. Here are some key meeting dates to mark in your calendar. All members, and friends and interested persons, welcome. General meetings are held at Burwood RSL, 96 Shaftsbury Avenue Burwood at 1.00pm. There is a demonstration at 11 am before each meeting and the program includes a guest speaker and member show and tell. The venue is Campbelltown Arts at Centre Cnr. Camden Road and Moore Oxley By-pass, Campbelltown. Closest major intersection is Narellan Road and Appin Road. Gallery opens at 10.00am , Show and tell at 11.30, Café for lunch or bring your own, Guest Speaker, 1.00pm, tea & coffee and light afternoon tea provided, meeting closes at 3.00 pm, Gallery closes at 4.00pm. Wheelchair access, Sculpture Garden, Art Gallery, Japanese Garden. Check the Guild website closer to the time for guest speaker and other details. 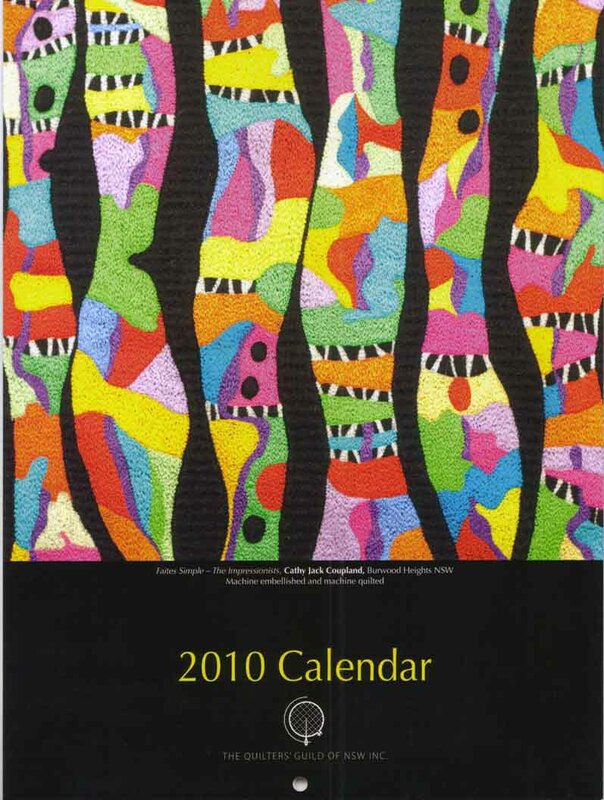 A visit to the airing of the quilts at Braidwood on 28 November 2009 is proposed. The bus will leave Sutherland (outside Council Chambers) at 7.30am and pick up at Strathfield Railway Station (Everton Rd-Parramatta Road side of the station) at 8.30am. The cost will be $40. There are still some spaces on the bus available. Please contact the Guild office (Tel: 9283 3737) to make your payment and to reserve your place. Friends of members are welcome to join the excursion. An obituary for past President Narelle Grieve appeared in the Sydney Morning Herald on 15 October 2009 and can be viewed online for a limited period. The guild newsletter, The Template, directly reaches over a 1000 dedicated quilters every quarter. The closing date for advertising in the December 2009 issue of the newsletter is Monday, 19 October 2009. The Guild's new printer arrangements mean that all advertisements can incorporate COLOUR at no extra charge and we offer a a range of advertisement sizes and prices.